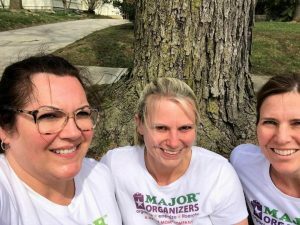 Last October, Major Organizers opened its first franchise in Columbus, Ohio, under the direction of Melanie Woods. This month, we celebrate Melanie’s 6 month anniversary and shine a spotlight on this Ohio native and her passion for organizing. Married to her high school sweetheart, Bill, and raising their two boys, Aaron and Conor, Melanie felt like her career in nursing didn’t allow her to be “present” with her family, even when she was physically home. “I would be so excited for the weekend,” she recalls “but by Sunday at noon, I turned into an unhappy person, knowing that I was closing in on going back to work that didn’t fulfill me.” A self-described “helper,” Melanie knew she still wanted a career serving others, but didn’t know what that might look like. Melanie became the first Major Organizers franchise owner in August 2016, and opened her doors for business in October. Since then, she has hired three Liberators (Professional Organizers) with a fourth ready to attend the Major Mom Academy™. The team serves clients across the Columbus Metro area – including Delaware and Franklin counties. Melanie is also a member of Faithful Organizers and the local and national chapters of the National Association of Professional Organizers (NAPO). Additionally, the company is dedicated to giving back to their hometown and has partnered with not-for-profit Common Ground Free Store, with plans to donate time and 10% of profits to the organization. “The first thing every client should know about us is that we live our brand promise: We make organizing fun, we get the job done and we don’t judge anyone! Next, they should know that they can be as involved or uninvolved as in the process as they want, but in the end, we are dedicated to creating organized spaces that fit how that particular client lives in their home. “If you want to call and are nervous,” Melanie advises “Visit MajorOrganizers.com which answers client FAQs and shows Before/After pictures of other jobs. If you still have reservations, reach out to our office to talk to a Liberator. We are always willing to answer questions and the free estimate can be performed over the phone if you’re not sure about having someone come into your home right away. Your mind will be set at ea se and you will be happy you called! Are you ready to get organized and find the peace in your home again? Do you have a group that would benefit from a presentation by Major Organizers? Melanie and her team would love to talk with you!